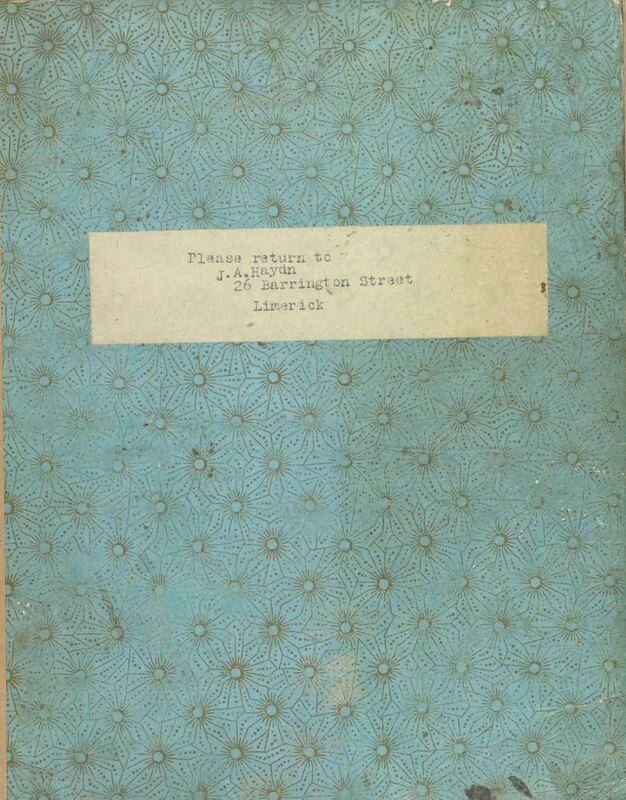 Those with an interest in the Longford/Roscommon region might be particularly interested in the latest finding at the Representative Church Body Library. Below is transcribed content of the parish registers of the former union of Bumlin, Kiltrustan and Lissonuffy in Co. Roscommon, together with the memorial inscriptions on the monuments in the surrounding churchyard adjacent to the parish church of St John the Baptist, covering the period 1811-1969. 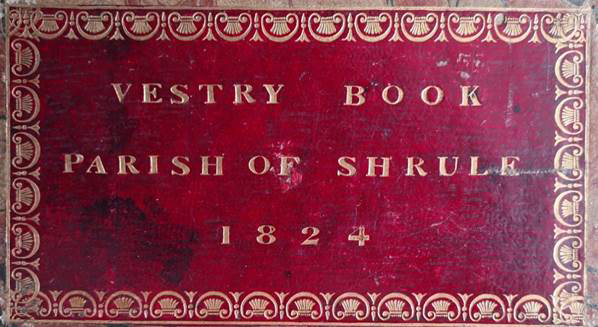 Collectively this work means that Strokestown is one of the first Church of Ireland parishes to have all of its principal historic records transcribed and available online. In accordance with best practice for online publication, the transcripts comprise baptisms and marriages 1811-1919, and burials and memorial inscriptions 1811-1969, and are fully indexed and searchable. The transcribed data is part of the Anglican Record Project, a long-running series of mainly Church of Ireland parish record transcriptions, initiated by Mark Williams and permanently available on the RCB Library website at www.ireland.anglican.org/about/rcb-library/anglican-record-project. Alan worked under the tutelage of Mark on the Bumlin registers and memorials inscriptions, and Mark’s input is specifically acknowledged. Their joint labour has made accessible for the first time a vast amount of ancestral and local history data that was hitherto relatively inaccessible. The permissionsof the Director of the National Archives,with whom the reproduction rights of parish registers reside on behalf of the state to 1871, as well as the Representative Church Body, are acknowledged by the Project. In 1751 Thomas Mahon MP of Strokestown House conveyed to the Bishop of Elphin an acre of land in Strokestown, for the purpose of erecting a new church, which was confirmed as the parish church in place of Bumlin in March 1754. The ancient church of Bumlin was by then “in a decayed and ruinous condition and the site thereof inconvenient” so the new church added to the embellishment of the new planned town he was developing. By 1813 the parish vestry sought a loan of £1,000 from the Board of First Fruits to add a tower and steeple to this building, neither of which were completed before the church was destroyed, apparently by a storm, in the winter of 1818/19, so eventually a new church building was consecrated on 27 August 1820 which remained in use until 1977, when it finally closed. The building was retained, however, and it re-opened as a heritage centre in 1982, and is now home to the Co. Roscommon Heritage and Genealogy Centre, and both it and the churchyard are well maintained. The earliest surviving registers and vestry minute book were presented by the Revd Edward Mahon (1776/7–1847) on his appointment as vicar in 1811. Fortunately, they were retained in local custody and thereby escaped the disastrous destruction of the Public Record Office of Ireland in June 1922. In the preliminary pages of the earliest register, Mahon’s personal annotation reveals his conscientiousness to be a good record keeper: having “found no such thing as a Registry Book” and “no registry whatsoever of Burials!! !” he took it upon himself to provide the book, which he purchased for £1.10.4. St Mary’s Cathedral in Limerick was founded in 1168 by King Domnhall Mor O’Brien (descendant of Brian Boru) and purportedly built on the site of the royal residence of the kings of Munster. This year has marked the 850th year since its foundation, and to conclude a year of anniversary celebrations, the RCB Library in Dublin has published online a digital copy of a previously hidden 19th-century source documenting the story of its renovation between 1859 and 1863, together with detailed analysis of its content. 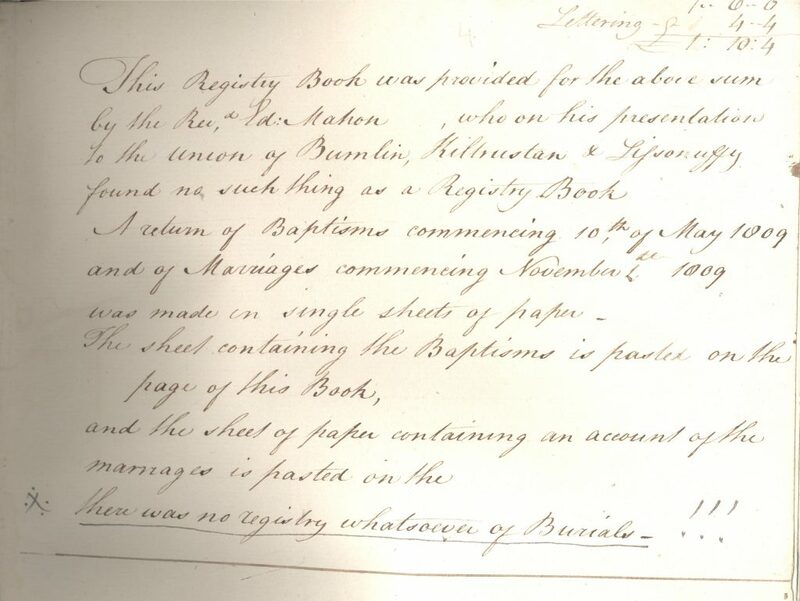 The volume came up for sale a year ago, and with local financial support from the Bishop, diocese and cathedral the Library, which is the Church of Ireland’s record repository, was enabled to purchase it, accessioning it as Ms 1048 and working creatively to promote its content, thereafter. 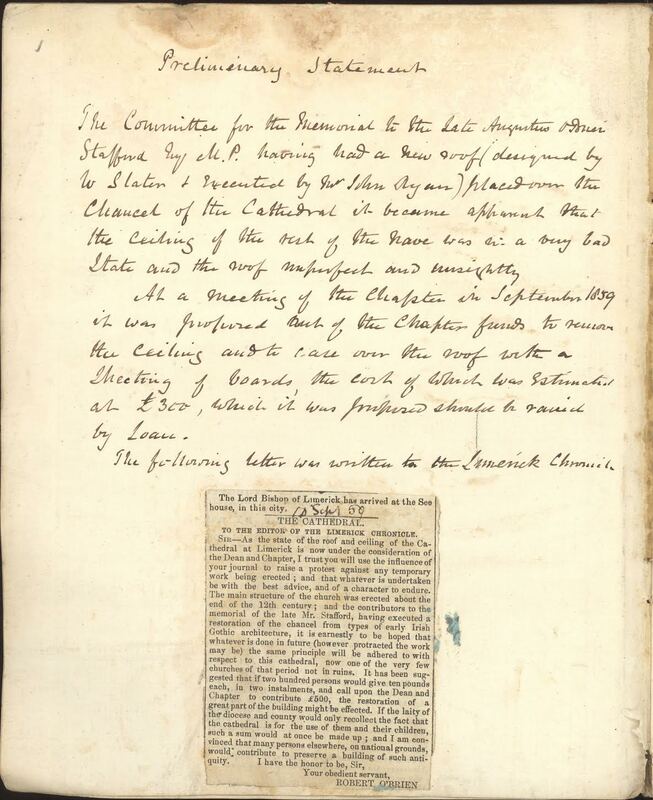 Ms 1048 is effectively a scrapbook of original minutes, press-cuttings, subscription lists and other memorabilia related to conservation and rebuilding works that took place in the cathedral between 1859 and 1863. The volume further includes articles, reports, and accounts of funds of the renovations up to and including 1874. It was assembled by a certain John Armour Haydn, whose name and presumed ownership appears on the front cover of the book. There are two possible creators of the volume – a father and a son. Haydn Sr. (1845-1920) was a canon, and also Treasurer (1906-1912), and Chancellor (1912-1913) of the cathedral in addition to being the Archdeacon of Limerick (1913-1918). It is probable that he compiled the text to record how his predecessors serving in the cathedral acquired funds and raised awareness of the structure. Alternatively, the name on the cover could also refer to his son, John Armour Haydn Jr. (1881-1957), a secretary of the cathedral vestry from at least the 1930s. Haydn Jr. commissioned a model of St Mary’s which is still on display at the church, indicating his own interest in the architecture of St Mary’s that may have equally inspired him to research the history of St Mary’s renovations. Like his father, Haydn Jr. was passionate about the history of St Mary’s and authored a guidebook for visitors to St Mary’s in 1950, as well as a booklet on the 15th-century misericords of St Mary’s. Whichever Haydn was responsible, as the online exhibition accompanying the digitzed copy makes clear, the volume is a Haydn creation of original materials dating from the time of restoration in 1859-1863, with some additional materials up to 1874. Whilst perhaps arranged into the volume at a later time, these are contemporary to the renovation work including even the original resolutions of the committee and trustees who oversaw the works. It thus makes a significant contribution to understanding the cathedral’s architectural history. The title page of the volume contains an explanatory “preliminary statement” revealing why the mid-19th century restoration works were required in 1859. A committee had been formed in September of that year to oversee the erection of a suitable memorial to the late Augustus Stafford O’Brien Stafford (1811-1857), remembered for his care of wounded soldiers in the Crimean War. The construction of his memorial (the window on the east end) attracted donations from all over Great Britain and Ireland, as evidenced by the subscriptions paid by figures such as the Duke of Cambridge (Prince George), the Archbishop of Armagh (the Most Revd John Beresford), Lord Chelmsford, the Bishops of Limerick, Killaloe, and Oxford, as well as Florence Nightingale. However in the course of the works for the memorial, it was revealed that the roof over the chancel had become “imperfect and unsightly”, requiring urgent attention. Thus, the volume is a window on hidden history detailing the causes of the restoration and conservation – the parts of the fabric that were replaced, but also how the cathedral’s essential medieval features were salvaged, and how the funds were raised to cover extensive costs. It is sobering when leafing through the volume to learn of the many complications to the building projects, and challenges of fund-raising; nothing has changed for those who safeguard such buildings today. Missed the last conference at Christ Church Cathedral on 3rd November? 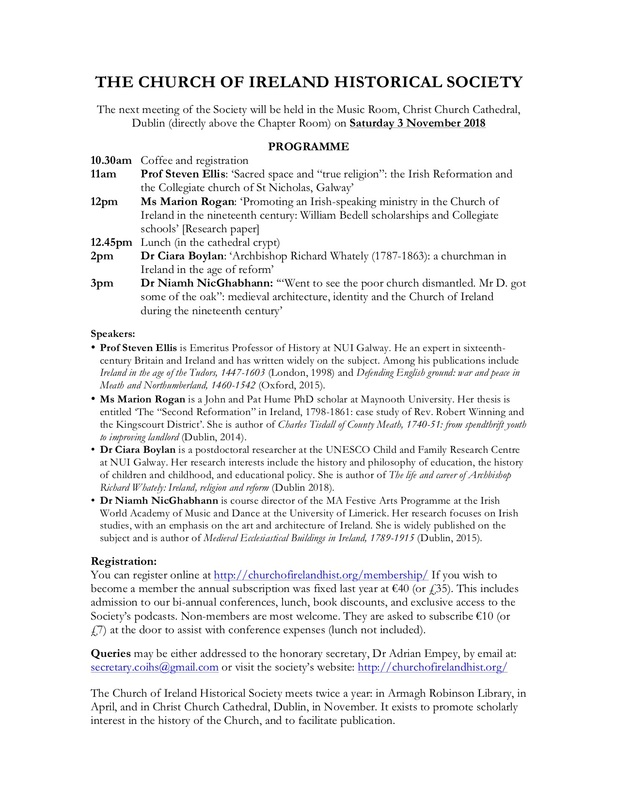 Members of the Church of Ireland Historical Society can now listen to the latest papers delivered by Professor Steven Ellis on the Reformation and St Nicholas’s Collegiate Church in Galway, Dr Ciara Boylan on the Archbishop Richard Whately of Dublin during the ‘age of reform’, and Dr Niamh NicGhabhann on medieval architecture, identity and the Church of Ireland in the nineteenth century. To hear the speakers visit the podcasts link and enter the password sent to your email from the honorary secretary, Dr Adrian Empey. You can also download the conference programme for further information about the conference by clicking on the archives link. If you are not a member but would like to hear these papers (as well as papers dating back to November 2013) you can join the Society by visiting the membership link. The annual subscription is €40 or £35. This includes free access to the podcasts in addition to many more great offers. There is also a special student discount of just €15 or £12 for those with a valid university card (alternatively students interested in joining can email the society and inform the secretary of your institution and contact details of your supervisor). 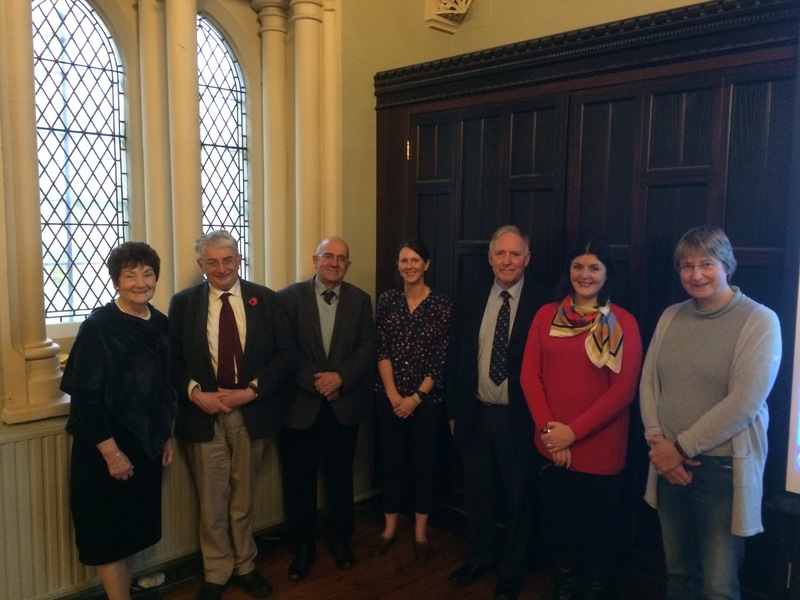 On Saturday 3rd November, the Church of Ireland Historical Society (COIHS) hosted its second conference of the year in the Music Room at Christ Church Cathedral. We had a superb turnout and wish to thank members, both old and new as well as day visitors who came to hear four excellent papers. We hope you enjoyed the day as much as we loved hosting the conference. As always, many thanks for the wonderful staff at Christ Church Cathedral for assisting us. 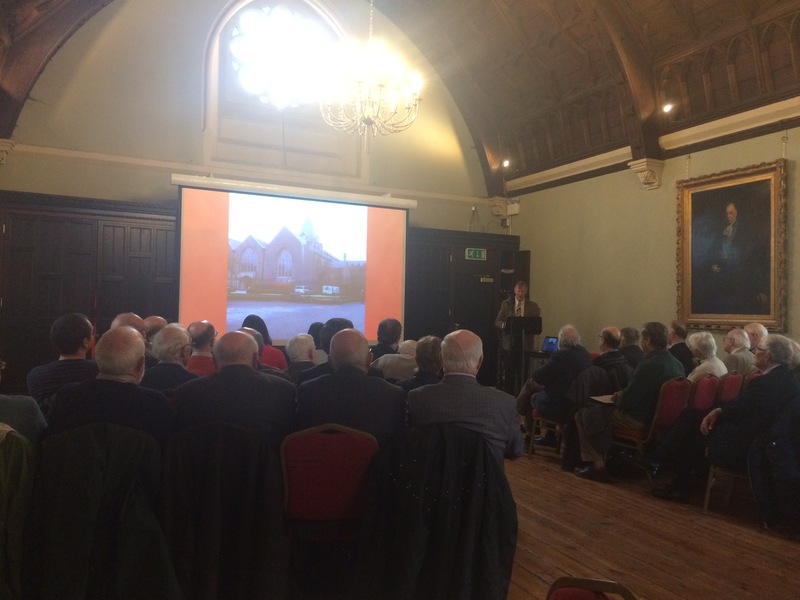 Professor Steven Ellis, who is Emeritus Professor of History at NUI Galway, initiated proceedings with a broad and fascinating examination of the Reformation in Galway and the changes affecting St Nicholas’s Collegiate Church. He noted, in particular, how the town was ripe for change and that the population and clergy were responsive to ecclesiastical reforms but over time the momentum was lost. Ms Marion Rogan, who is pursuing her PhD at Maynooth University, was the second presenter of the day. She delivered an excellent paper on the Irish-speaking ministry in the Church of Ireland. 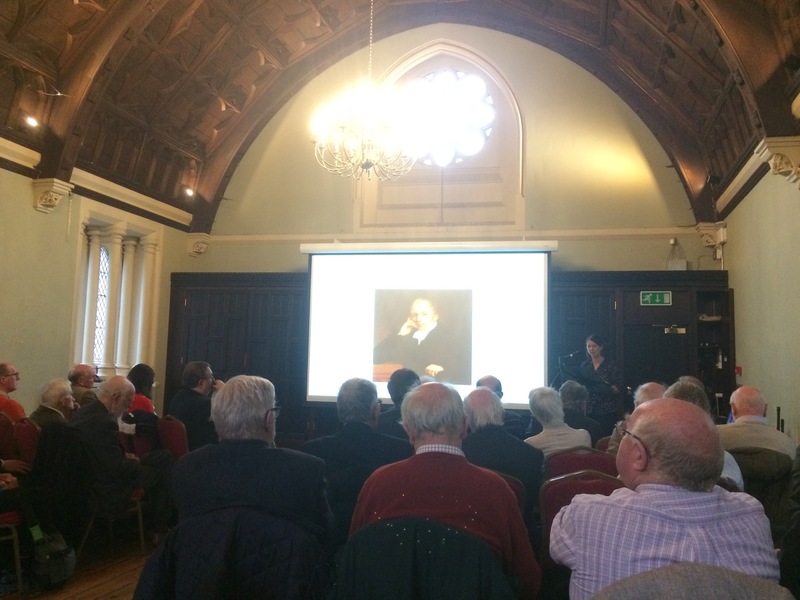 After lunch, Dr Ciara Boylan of NUI Galway gave a splendid presentation on the life and career of Archbishop Richard Whately, which is the focus of her recently published book with Four Courts Press (click here for details). While noting that the archbishop was less than popular in social circles, his contribution to the political and social forum in the nineteenth-century was significant, particularly in educational reform. The day finished with a paper by Dr Niamh NicGhabann from the University of Limerick who gave an absorbing paper on medieval architecture and how that shaped the identity of the Church of Ireland in the nineteenth century. Members of the Society will be notified when the presentations delivered by Professor Ellis, Dr Boylan and Dr NicGhabhann are available on podcast. If anyone wishes to hear these papers but has not joined the Society, you are welcome to subscribe to our annual membership by visiting our membership page. Postgraduate students can avail of our special discount membership but are asked to email the secretary with proof on institutional affiliation prior to subscribing. Please visit the contact page. All members of the public are welcome to join COIHS. One hundred years on, marking the anniversary of this event, the RCB Library in Dublin is making both editions available as downloadable PDFs. Research into the armistice highlights the usefulness of the Gazette as a contemporary commentator and eye-witness on events in the past. 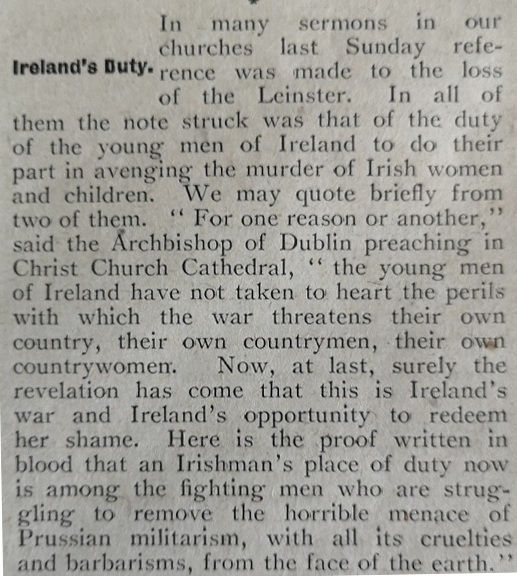 The paper’s editorials, diocesan notices and correspondence pages, when combined with parish records, have collectively enabled Dr Miriam Moffitt once again to peel back the layers of hidden history and recover specifically how the Church of Ireland responded to the end of hostilities and other political and social concerns of the time, both at local and national level. 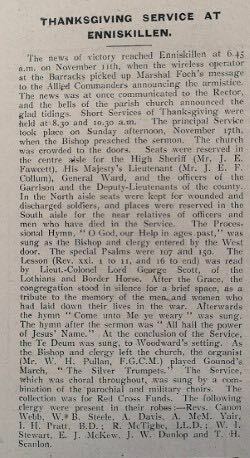 Church of Ireland Gazette, 22nd November 1918, reporting events in Enniskillen early on 11th November 1918. Canon Harry Dobbs’ colourful annotation of the Preachers book, All Saints, Blackrock, on the same date, © RCB Library, P714/8/6. The new exhibition also explores the context in which the realities of the war’s end brought for Ireland. In many parishes, significant numbers were succumbing to the raging flu epidemic raging while a second concern worrying many people, and reflected in the pages of the Gazette, was the realisation that the outstanding political issues of the Irish situation had to be addressed – a situation captured under the 22nd November 1918 lead article, “Irish government policy and Ireland”. 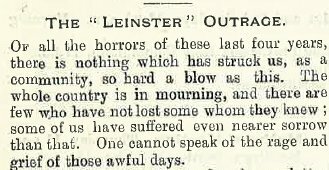 The Gazette recognised the deeply-held political and economic opinions on both sides and came to the view in its editorial that ‘the outlook in Ireland was rarely more dark’. In tandem with the multitude of events taking place island-wide across the Church to mark the centenary (see listing at http://bit.ly/2PbpcpJ), it is hoped that this blog might further enable reflection and understanding of the context in which to remember those who lost their lives and why the episode that was naively termed ‘the war to end all wars’ exacted such a high death toll across all of Europe. The Church of Ireland Historical Society’s second conference of the year will be on Saturday, 3 November 2018 in Christ Church Cathedral’s Music Room, Dublin. Tea and coffee will be served from 10.30am and the first paper will start at 11am. Confirmed speakers are Professor Steven Ellis (NUI Galway), Dr Ciara Boylan (NUI Galway), and Dr Niamh NicGhabhann (University of Limerick). 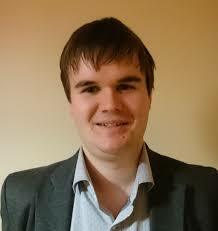 The research paper will be delivered by Ms Marion Rogan, who is pursuing her PhD at Maynooth University. The full programme can be seen below. The conference is open to all members of the public. There is a day fee of €10 (or £7) for non-members to assist with conference expenses, payable at the registration desk in the Music Room, but anyone can become a member for €40 (or £35). Those who join the Society but are unable to attend either of our conferences in Armagh (in April) or Christ Church Cathedral, Dublin (in November) will be given exclusive access to the podcasts which record these papers. For further details of our membership package please visit our membership page. However, its archival and curatorial responsibilities soon evolved in the context of the PROI tragedy in 1922 with the Library becoming the focus of the Ecclesiastical Records Committee of the General Synod, by providing a home for stray church records. The record-keeping function was sporadic until the 1960s, when amalgamations of parishes and dioceses led to a marked increase in archival activity and the need to keep the Church’s records safe. The Library’s archival role was formalised in 1981, with the appointment of an archivist, and agreement with the Director of the National Archives followed designating the Library as the official place of deposit for all Church of Ireland registers in the Republic – those predating Disestablishment being national archives, and thus belonging to the state. Dr Miriam Moffitt has brought a professional historian’s perspective on the content of this particular collection and the array of supporting resources also available in the RCB Library that shed a light on the story of this particular Church of Ireland parish, and its community. The Representative Church Body Library has welcomed the announcement of a €100,000 capital grant towards the digitisation of Church of Ireland parish registers as part of the Department of Culture, Heritage and Gaeltacht’s digitisation scheme. The funding was announced by the Minister for Culture, Heritage and the Gaeltacht, Ms Josepha Madigan TD, during a visit to the Library yesterday (11 September). 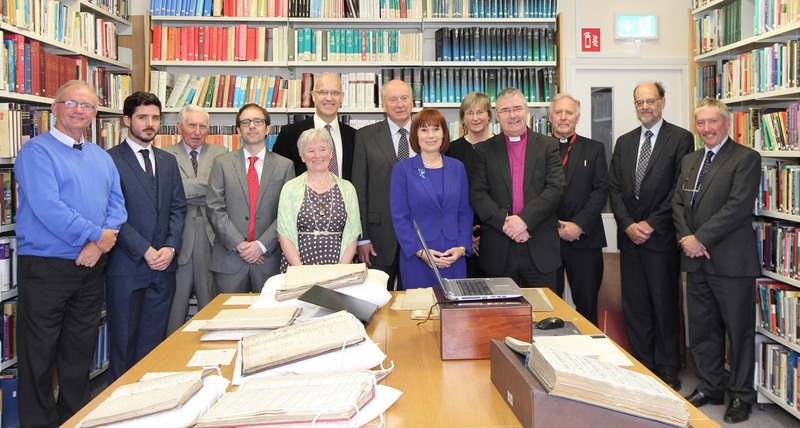 As part of the visit, Minister Madigan viewed a number of original registers, the earliest of which is dated 1619. 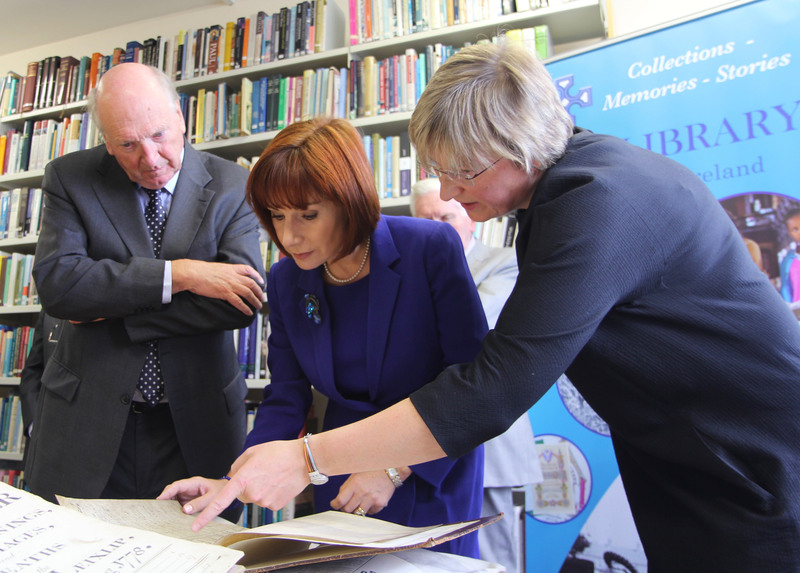 Minister for Culture, Heritage and the Gaeltacht Josepha Madigan viewing some of the RCB Library’s records with the Librarian and Archivist, Dr Susan Hood, and Dr Michael Webb, Chairperson of the Library and Archives Committee, during the Minister’s informal visit to the Library to announce a capital grant for the digitisation of Church of Ireland parish registers. The Representative Church Body Library, at Braemor Park, Dublin, is the Church of Ireland’s repository for archives and manuscripts, including 1,120 collections of parish records. The Library’s collections also include the archives of the Church’s dioceses, cathedrals, architectural drawings, the administrative records of the Representative Church Body and its multiple committees, and thousands of manuscripts relating to the Church’s people, buildings and activities, spanning from medieval times to the present.